Yeah, today is a good day, I woke up at 10 am, messed around for 2 hours and then had lunch. But when I saw who is the guy that posted I IMMEDIATELY changed my mind, this wasn’t a fake, the guy is Macci, an overclocking legend who is working for AMD from many years. That’s a BIG news for us, 8.4 GHz with a B2 step ES CPU is something way way better than what I expected. 8.4 GHz at liquid elium will likely be something around 8 GHz at LN2 and around 7.6⁄7.7 GHz for the single thread benchmarks. 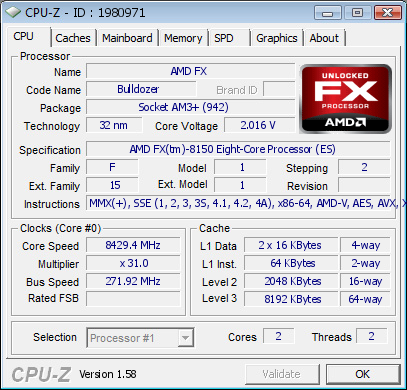 Now, with all the fucktard limitations SandyBitch crap have and SandyBitch-E crap will have I’m starting to think that finally AMD can have a CPU to compete in the extreme overclocking world. If the IPC of these new BD is 15⁄20% better than thuban/deneb stuff these CPUs will spank Intel really hard especially looking at how low priced this stuff is and how high priced the Intel crap is.